A walk in the woods is how it is billed; however, a hike is the reality. Clean eating is the goal; steamed vegetables from a garden less than ½ mile from the house are the mainstay. Fresh fruit—need I say more; freshly-picked berries are from a neighboring farmer’s blackberry and blueberry bushes. This may sound like a complaint and you are certainly reading the tone correctly. I am not a fan of real nature. I love talking about it, I love reading about it and I even love looking at pictures in magazines about it. But being in it, ‘walking’ through it, hearing the living beings in it, stumbling over roots and rocks, jumping over small creeks and large tree stumps: this is a completely different story. 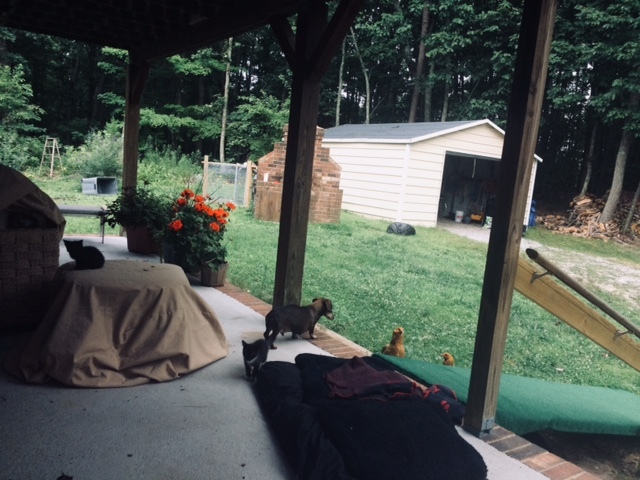 CARAS, Cinderella’s Animal Rescue and Sanctuary, is a farm in rural Green Bay, Virginia, and the brain-child of a passionate conservationist who is truly a naturalist, Cinderella Bermudez. Cinderella is a self-made entrepreneur, world traveler, adventurer, learner and hard-working woman. We’re life-long acquaintances who have developed a close friendship in a year or so. I’m visiting from Houston and taking some time to visit Cinderella’s newest ‘baby’: The Farm. The drive from Washington, D.C. is amazing when the comparison is the low-lying, sea-level vegetation of the Gulf Coast that is preceded by the ever-increasing concrete ‘jungle’ to which millions are accustomed and more are flocking towards as we speak. Back to CARAS. The country-side is a stunning array of trees and mountains, rivers and creeks, reservoirs and lakes; the green spaces are not contrived and strategically arranged. Rather, the organic ebb and flow of groves of trees with homes and businesses built into the landscape leave visitors with a sense of peace that only comes from being in nature, really being IN it. Slowly leaving the city behind and getting closer to Blankenship Pond Road is a preview of the truth of the matter: ready or not, here comes the ‘real’ nature many profess to love and will be required to attest to after a few days of being in the reality of all that nature encompasses. The two farm houses, the barn, the chicken coop, the storage shed: these are the modern conveniences this country girl-turned-city-dweller spies as soon as we cross the cattle guard. However, those structures become secondary immediately: the lush grasses, the tall groves of trees marking the property line, the two ponds mirroring the trees that line both ponds, the rolling hills and deep shadows of the woods, all 68+ acres, are breathtaking. The Bee Sanctuary, the Pollinator Patches, the raised-bed Vegetable Garden, the lone 100+ foot “Christmas” tree in the middle of the pasture, the rolling hills within the property: these are markers of nature that beckon the eyes while the fresh air and cool breeze caress the skin as we step out of the car to take it all in. Nope. I was not prepared to fall in love. I was not prepared to be entranced. I was not prepared to feel such freedom. I was not prepared for the acute silence. I was not prepared for the total and complete sense of awe. I hear people talking. I hear ambient noise of unloading and arranging of this and that. However, I cannot hear the details. The sense of awesome wonder is overwhelming that such a place feels a million miles away from any semblance of city life. The simplicity of nature can be overwhelming because of the uncomplicated, unjumbled, unencumbered, unreal reality of being in such a place. The echo of birds chirping and calling to each other while the distant splash of something jumping in the pond is followed by frogs singing their unique songs as daylight fades to the twinkling fireflies flitting about while the moon goes higher and darkness reveals an array of stars so clearly visible it seems as though one can reach right out and catch one: this is the first night of the rest of my life. I’m only here for a short while, but I know I’ll be back to walk through the woods, hike the new trails, feed the chickens, harvest the fresh produce from the organic vegetable garden and meet with the neighbors to taste the freshly gathered organic honey and berries. I know I’ll be back, again and again. Donna Gordon is a small-town girl living in the big city and trekking through various places to see what she can learn and write about in her journals and the occasional blog post. She teaches English in the city and loves life! You can reach her at writingandenglisharefun@gmail.com.